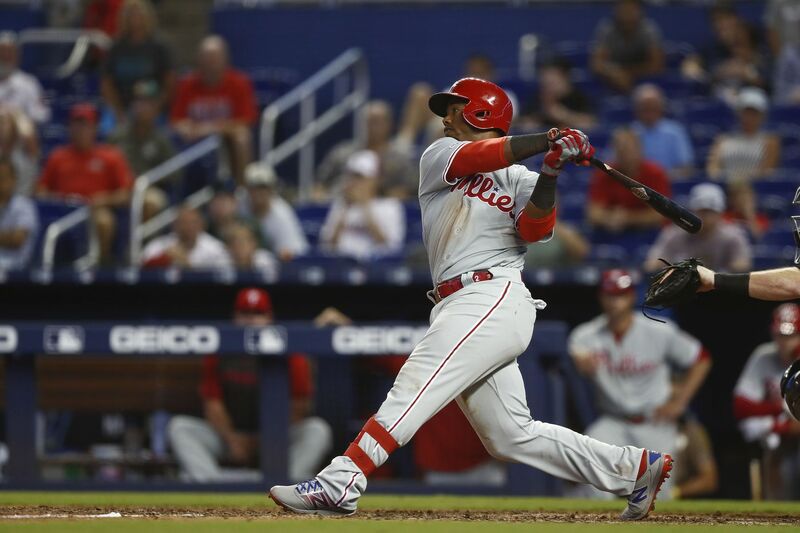 Jean Segura's first home run as a Phillie came in the top of the 14th at Marlins Park on Sunday. MIAMI -- If, by chance, the Phillies were predisposed to thinking that they would manhandle the Marlins 19 times this season by merely showing up for work, the last two games should disabuse them of that notion. Never mind that the Phillies won here on Sunday, 3-1, and claimed two of the three games in South Florida. It took eight scoreless innings from seven relief pitchers and a two-run home run in the 14th inning by Jean Segura for them to finally vanquish a young Marlins pitching staff that features few recognizable names but really good stuff. Indeed, after putting up five runs in the third inning of the series opener Friday night, the Phillies’ high-powered offense scored in only five of the next 29 innings. They were shut out for eight innings of Saturday night’s 10-3 loss and limited to one run over the first 13 innings Sunday by Marlins starter Jose Urena and six relievers. Credit this victory, then, to the Phillies’ bullpen, which capped a rough week with a tour de force. Last Tuesday night, the Phillies gave up nine unanswered runs, six by the relievers, in a fall-from-ahead loss to the Nationals. The bullpen gave up another eight runs the following night in a 15-1 blowout. And although manager Gabe Kapler and general manager Matt Klentak reiterated their confidence in the relief pitching, fans all but screamed for the Phillies to race out and write a blank check to free-agent closer Craig Kimbrel. Vince Velasquez took a no-hitter into the sixth inning. Consider this the bullpen’s redemption. After starter Vince Velasquez lost a no-hit bid by giving up a solo homer to Brian Anderson in the sixth inning, Pat Neshek, Adam Morgan, Hector Neris, David Robertson, Seranthony Dominguez, Victor Arano, and finally Jose Alvarez passed the baton, holding the Marlins to three hits and two walks. At one point, Phillies relievers struck out nine consecutive batters. “We had a lot of guys in our bullpen step up in a really major way,” Kapler said. None more than Arano, who faced six batters and struck them all out. What a difference from spring training, when Arano gave up 17 hits and four walks in four innings, posted a 45.00 ERA, and punched his ticket to open the season in triple-A. Arano’s signature slider returned at Lehigh Valley, in part because he found the right finger pressure on the ball to restore both his usual velocity and bite. And if Sunday was any indication, it’s back to being an untouchable pitch. The Phillies took a lead on Cesar Hernandez’s solo homer in the fourth inning. They had chances to tack on runs but went 3-for-12 with runners in scoring position and left 13 on base. The Marlins' Chad Wallach lays the tag down on Bryce Harper at home plate. Bryce Harper forced the issue in the sixth inning. After lining a one-out double, he tried to score from second base on Rhys Hoskins' single to left field. Third-base coach Dusty Wathan waved Harper home, but the slightest hesitation around third base proved costly. Shortstop J.T. Riddle's relay of left fielder Curtis Granderson's throw was on time for catcher Chad Wallach to apply the tag. Andrew McCutchen broke the ice in the 14th inning with a one-out triple. Segura, who makes more contact than anyone in the Phillies’ lineup, was the perfect hitter to have at the plate. It also left the Phillies relieved to squeak out a series victory against the worst team in the division. They can thank their relievers for that.